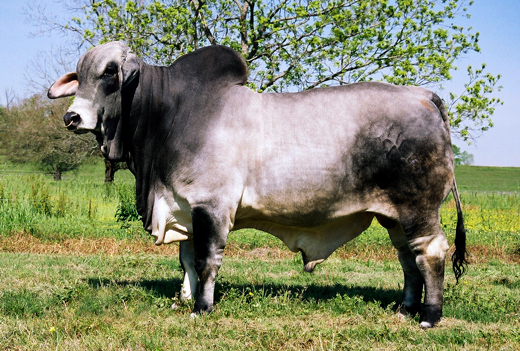 Mr. KF Sietes Success 75/3 has the pedigree, performance and phenotype to be a leader in the Brahman Breed. At an early age he began his successful show career being named the 2003 National Reserve Calf Champion. Since his first championship he has dominated the Junior and Senior Divisions and in the last two years has earned over 21 championships from the breeds toughest critics. His most prestigious wins to date were at the 2003 National Show, 2004 International Show, 2005 LBJ State Show and concluding with the 2005 All American Grand Championship. As if his own performance were not enough, his pedigree is second to none with 5 National or International Champions and two ABBA Show Animals of the year in the first two generations. If you are looking for the next bull to successfully impact your program, Mr. KF Sietes Success 75/3 is your logical choice. KF 75 is the offspring of two ABBA show animals of the year and has a pedigree that is one of a kind. From winning 18 Championship awards in his show career to siring some outstanding calves, this bull is great for breeding red or gray!